Meat free savoury flavour mini sausages, made with Mycoprotein? Proudly meat free. Satisfyingly simple. Ready to eat. High in protein and fibre. Vegetarian Society approved. 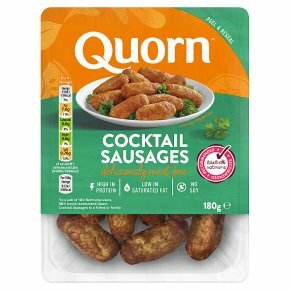 Our Quorn Cocktail Sausages are ready to eat. Mini mouthfuls of deliciousness, these vegetarian snacks are great for lunchboxes or picnics. Ready to eat. If you choose to cook them, simply remove all packaging. Preheat oven to 200°C/Fan 180°C/Gas 6. Place on a baking tray. Cook on the middle shelf for 8 minutes. All appliances vary, these are guidelines only. Check product is piping hot before serving.